Step 1: Visit this URL and log in to the Google Account associated with your listing: https://www.google.com/business/. Step 2: Select your website. 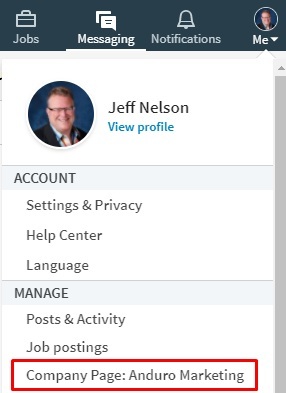 Step 3: Click Users from the menu on the left sidebar. Step 5: Add Jeff Nelson (jeffxnelson@gmail.com). Give Jeff Editor status. a) You can give is the ID and password to your account. c) Alternatively, you can send the number of Impressions or send us a screenshot. You can give us your login information or send us a report. Step 3: A new tab will open up. Click on Analytics, then on Updates. Step 4: Be sure you have selected Impressions, then click on Last 3 months. a) Give us access by sending us your login ID and PW. Step 4: At the beginning of the month, send us the number of people who viewed your profile in the last 90 days. I use my LinkedIn profile all the time. It is a great way to connect with people - worldwide - and stay in touch. Below are some of the things that I do when I’m using LinkedIn. Hopefully, these tips and tricks will be helpful for you. I like using that mobile app. It is quick and easy to use. Many tasks are easier to do on the mobile app when compared to the desktop version. If you haven’t downloaded the mobile app, you should try it - it’s worth the effort. This is a little-known way to compliment one of your connections. Start by finding the profile of the person that you want to send a kudo. BTW, a kudo is a compliment and there is no plural - just kudo. Click on More and then Give Kudos. Select the image that is suitable for the occasion and the message that you want. Then post. It’s easy and fun. And your connection will love the attention. This is what your kudo will look like once you have posted it. Yes, QR codes are still a thing, and on LinkedIn they are quite useful. Start by going to your home screen and clicking the 4 squares to the right of search. Then choose either Scan to scan someone else’s QR code or My Code to generate your QR code for someone else to use. Obviously, this is something that you do with another person, phone to phone. I suppose you could do a screenshot of your own QR code and use that somehow, but I haven’t tried that. I like connecting with people. I don’t care who you are or what you do, I’ll check the connection. Sure, I get “spammers” sending me messages. I don’t mind. I like to know what others are doing and every once in a while, I connect with someone who is interesting. Most of the messages that I get are thank you’s. I often click on the 3 lines at the top right and then on Unread, so that I can quickly read and sometimes reply to all the messages that I haven’t read. The number of notifications can be overwhelming. 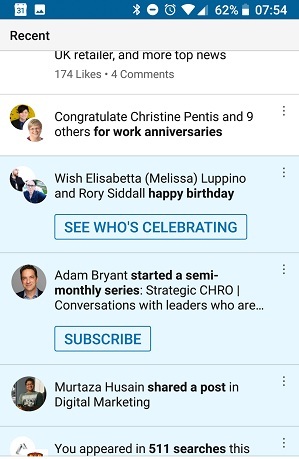 I have LinkedIn set-up to notify me of everything. I don’t get notifications on my phone, just to the app. It is too distracting to get notifications on my phone. Typically, I log in once a day - sometimes twice. Below is an example of a notification related to a post that I made recently. These reminders for Congratulations and Birthdays come up under notifications. I respond to all of them. Again, this is a good way of staying in touch. One of the notifications you should receive is the number of Search Appearances in the most recent week. This is the number of times your profile appeared in search results. I receive these notifications on Monday mornings. Each week the number is different. Higher numbers of search appearances are based on how active you are on LinkedIn and the quality of your posts. Posts get more views by far when compared to Articles. I hardly publish Articles any more - they are not worth the effort. Here's to happy posting. I hope these tips and tricks are helpful. We recently had a client ask us to export his contacts from Facebook. I didn’t know that this was possible but if the contact has added an email address in the public area of their profile - About / Overview section - then an export is possible. See image below for the location of the email address on the About page. Below are instructions to export your contacts and their email addresses from Facebook. Note: the export is in HTML format so you have to so some fancy copy, pasting and replacing to get a CSV file. When it comes to reading, 2018 was a banner year for me. I think I read nearly one book per month. This is a big change for me. Up until recent years, I had not read too many non-fiction books. I was teaching quite a bit at the University of Calgary and that soaked up a bunch of my free time and energy. As you start the new year, you may want to have a look at a few of the books that I read in 2018. Here is a list of the books that I remember reading and still have in my possession. I have included a quick summary and a review. Every company has its up and downs. One of the things I have wanted to do for the last few years is reign in expenses. This book, Profit First by Mike Michalowicz, was the spark to getting our company started. The basic premise is the formula Revenue minus Expenses equals Profit. The author changes this formula to be Revenue minus Profit equals Expenses and this is a key difference. The emphasis is on Profit as opposed to spending money and then whatever is left over is Profit. We didn't follow all the principles outlined in the book but we did Implement if you bank accounts to collect specific expenses like GST and an account for Profit. Now we are looking at all our expenses and ruthlessly cutting back on anything that is not absolutely necessary. I'm johnny-comes-lately when it came to reading this book but it was definitely worth reading. As most of you know, Sheryl Sandberg is the CEO of Facebook. This is her first book. I haven't read her second book which is called Plan B. 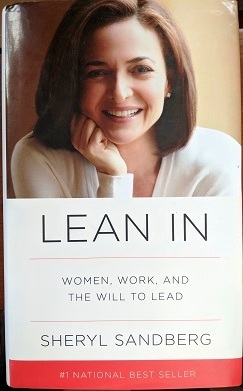 In this book, Sandberg tells many interesting stories about her experiences as an employee of Google and Facebook. I like your style of writing and I like her perspective. I valued her open approach. Dan Frederick recommended this book to me. Dan and I have weekly conversations where we talk about what's going on with our business lives. I enjoy and value my conversations with Dan. During one of our conversations he recommended that I read this book by Don Miguel Ruiz. The specific agreement that Dan suggested I look at was the second agreement: Don't take things personally. I picked up a used copy of the book at Fair’s Fair Books in Calgary. The book is excellent. To be honest, I struggle with putting into practice all four agreements. But as a result of reading this book I have found that I am taking less things personally than I was previously. 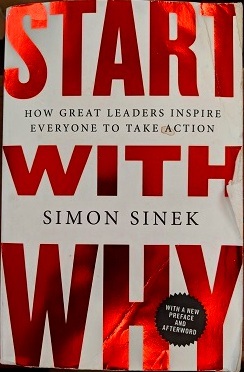 Believe it or not, this book by Simon Sinek is now 10 years old. His TED Talk of the same name has over 42 million views. Sinek’s concept of The Golden Circle, comprised of What, How and Why, is a fundamental business concept nowadays - I read about it everywhere. I had high hopes before reading this book. Structuring a book as a story with characters, sort of like “The Little Prince” or The Alchemist, is often a helpful way to present a topic or a concept. That is what is used in this book. It should work but it wasn’t life-changing for me. Call me a skeptic but I didn't find these laws to be all that profound - useful maybe, but not profound. This is the latest collaboration by John David Mann. In this book, Mann teams up with Brandon Webb. Webb generated quite a bit of controversy even before writing this book but I really liked the concept and the stories. It is well written. I really liked the story of Mann teaching his friend who is successful in business but scared stiff of water, to swim. There are excellent principles in the techniques that Mann uses. I probably would start with “focus on what matters” but that’s just me. Regardless, I loved this book. It is a valuable read. Did you see the movie The Wolf of Wall Street? Well, Jordon Belfort is the guy. This is his book with his “secrets”. The movie stars Leonardo DiCaprio, Jonah Hill, Margot Robbie, Matthew McConaughey, and Rob Reiner. The music in the movie is excellent. The scripts, the story and the scenes are hilarious. One would hope that the book would be as good as the movie - it isn’t. In Way of the Wolf, Belfort outlines his concept of Straight Line Selling - all of which I have forgotten. It’s good but not repeatable outside of the business of selling penny stock to the top 1% of American investors. 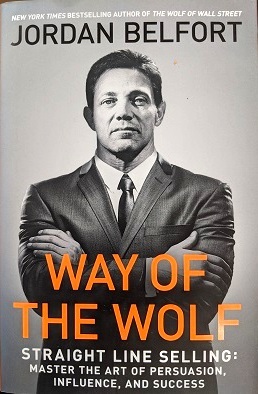 I bought the audiobook as well so that I could listen to Belfort's style. I left every chapter thinking he was swindling me - and he did - I bought the book twice. Maybe his techniques work better than I thought. Even though Leonard is a black belt Aikido instructor he stresses that he is still a student. I respect that. This is a good book. As some of you may know I lost over 30 lbs in 2017. This was a huge achievement for me. Losing weight was a long-standing goal of mine for far too many years. But after losing weight my next goal was to keep the weight off and maybe even lose a bit more. This book was key in helping me stabilize and maintain my weight. The concept of high fat low carbs was new and foreign to me. I grew up in the era of low fat high carbs. It took me a while to adjust. Now I focus on eating bacon, fish, some red meet, and above-ground-vegetables. Once in a while I have some bread, fruit and yogurt but I have been able to reduce my cravings for these food groups considerably. I have almost totally eliminated sugars, desserts, and starchy vegetables. I’m enjoying the new flavors and the new lifestyle. Are you thinking about writing a book? Have a look at these workshops. Here is a list of upcoming sessions and workshops in Calgary related to writing a book. If you are thinking about writing a book in 2019, you should consider attending one of these sessions. Pick the one that fits your needs at this time. He owns Light Cellar - a great health food store that is like no other. I attended this session in the Fall - excellent, well worth the $30. Lyn Cadence who is hosting this session: Publishing Means Business: Finish Writing Your Non-Fiction Book & Promote It... I’ll be attending this workshop on Jan 25 and 26, 2019.